The Apple of His Eyes: What a Saturday! It is really extremely rare that Kevin doesn't have to work on a Saturday, and it only happens once in a blue moon. 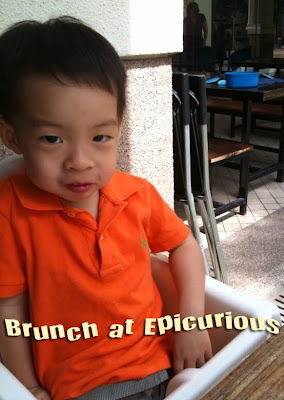 I grabbed the opportunity to drag him out of the house to try out Epicurious. A place that I have been wanting to visit, for brunch. In fact, it is a toil and moil to introduce or sell a brand new brunch location to these two male, that's because, Kevin benchmarked every brunch with Jones, and Ziv on the other hand, is finical about the type of sausage he puts in his mouth. I love going to Epicurious, and marked it as one of my fave haunt right now, because, those who patronize Epicurious are simple, cause they are mainly dressed in dishabille, very unlike of the crowd at Spruce. 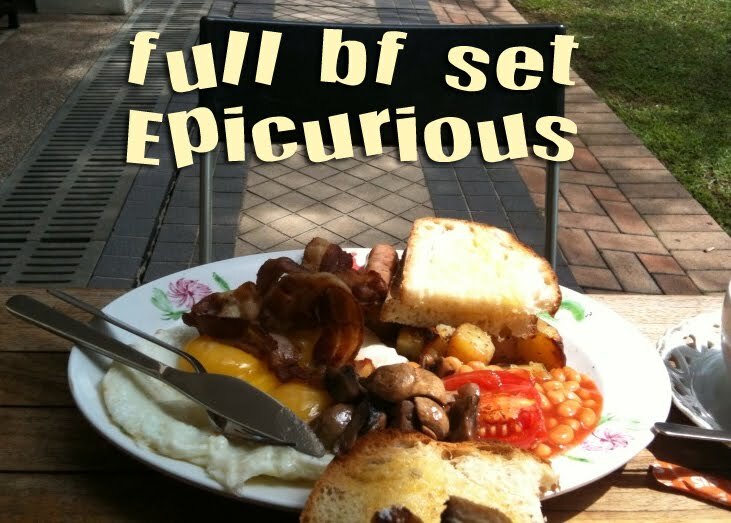 So, there is no pressure to put on makeup or dress well to be seen at Epicurious. Today's brunch exceeded our expectation. Initially, we were pretty cheesed-off by their service attitude, first, they do not allow reservation, second, at the entrance, there was a sign that read something like this, "call Jasmine for a seat" and there was no sign of human standing at the door that looked like 'Jasmine'. I called up upon a male waiter and asked him, "Where is Jasmine?" He replied, "She is not here today." Anyway, he called the manager to get us a seat. The serving of the food was pretty slow, the drinks was served first followed by the food. Here's what I ordered. Egg Benedicts. For whereever I go, I am sure to order Egg Benedicts because that looked more like a breakfast to me. 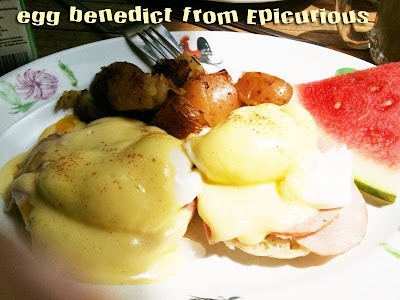 The surprise that came long with the Egg Benedicts was the thin slice of watermelon. Better than nothing, at least, there was fruit. I liked how it was cooked, especially the grilled potato with skin. I specially ordered Choco-Nana for Ziv. 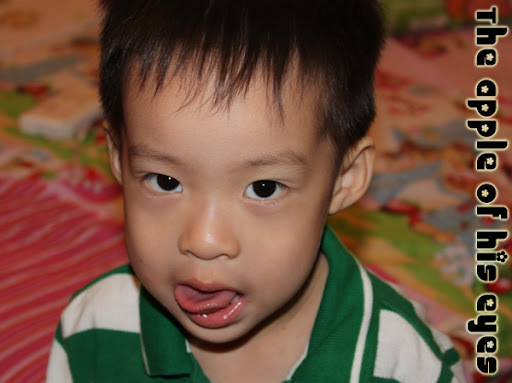 It turned out that the finicky boy was more interested in the food on his Daddy's plate. The bread and sausages, as usual! 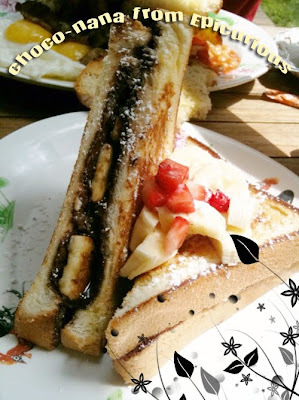 The Choco-Nana was sinfully delicious. Diced strawberries, banana slices, thick white bread and the generous spread of Nutella, H-E-A-V-E-N!! Since Ziv wasn't a bit interested, I ate it all by myself. I thought I gained a pound after putting this sinful piece in my tummy. The contented boy, with bread in his mouth. As usual, Kevin ordered his full breakfast set, completed with 3 slices of bread, 3 tiny sausages, bacon, baked beans, 2 sunny side up eggs, grilled potato and mushroom! I didn't realise that the breakfast had so much varieties until I typed it out. All in all, he was satisfied. And that means, we can come back again! Since the agenda was pretty empty for the day, I suggested to walk over to Medi-Ya to stock up my Japanese snacks drawer. I love going to Medi-Ya for obvious reason, I can't get enough of Japanese snacks and there can't be found even in the Japanese section in Cold Storage supermarket. 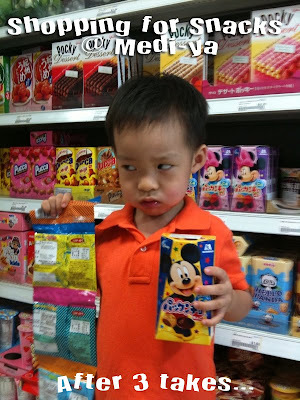 Ziv loves Japanese snacks too. 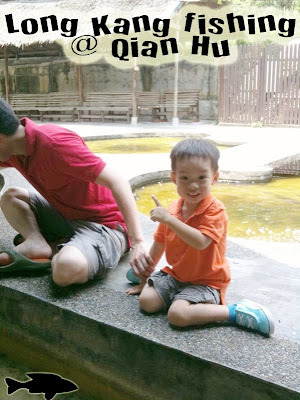 Because I wanted to build a pond in the balcony, so I suggested (again) to go Qian Hu. 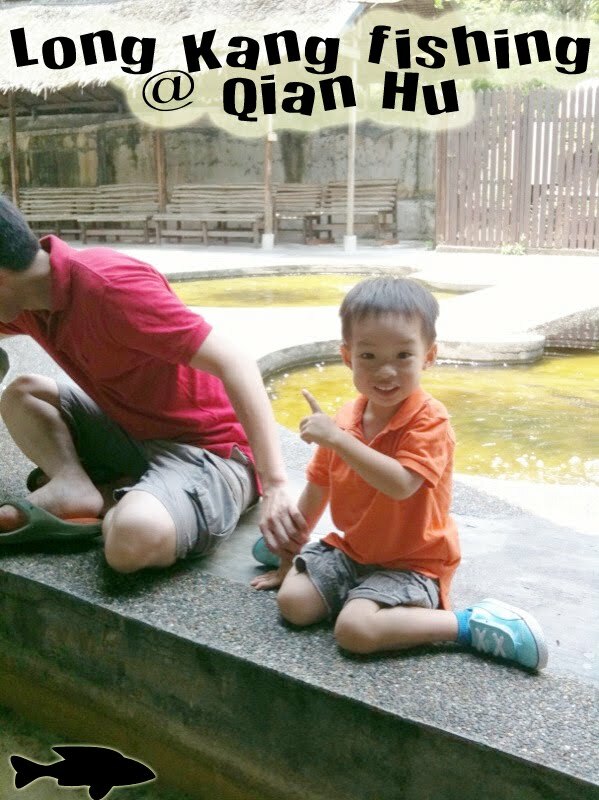 It was my 2nd time to the fish farm and each time, there was a surprise. 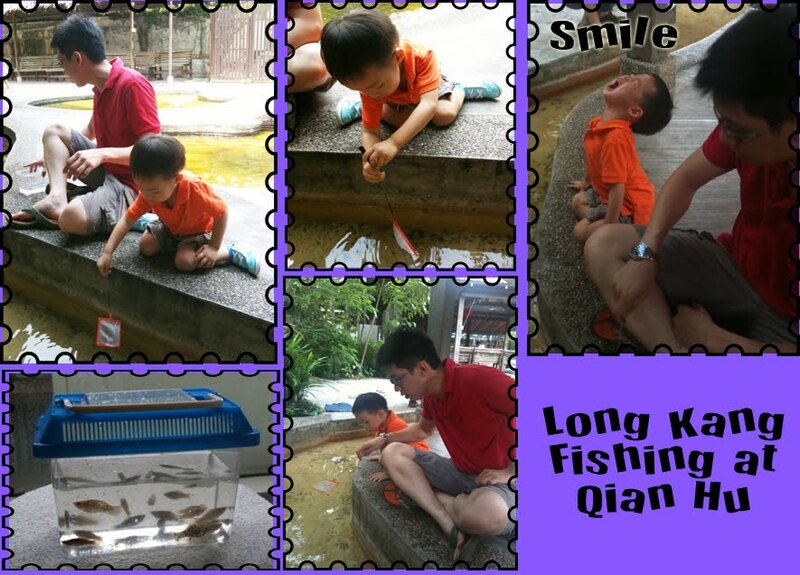 I still remembered Kevin and I went to the fish spa last year and this time round with Ziv, long kang fishing. It brought back many of Kevin's memories, he told me. Anyway, he seemed to be the one who was more interested in the fishing than Ziv. We had a reasonable amount of fishes. The fishes are now at home, I wonder how long will they survive in the hands of Ziv. Today is really a fun-filled Saturday for us. I hope we can do this more often rather than just shopping.